All The Benefits of a Face Lift Surgery Without the Surgery | Boris M. Ackerman, M.D. Dr. Boris Ackerman a Newport Beach Ca Plastic Surgeon says the liquid facelift procedure is on the rise. A liquid facelift is a process that provides many of the same benefits of a surgical face lift, without actually undergoing any kind of surgery. It is referred to as a ‘liquid’ face lift because materials such as Botox, Radiesse, Juvederm, and Sculptra are simply injected into the facial skin at strategic points to effect tightening, contouring, or lifting of the skin. All these products act as injectable fillers which can achieve dramatic results that cause wrinkles to disappear, sagging skin to firm up, and fine lines to melt away. These are generally conditions which appear as people age, and the firmness of youth begins to fade. Typically at such times, the facial area may develop vertical lip lines, lines along the side of the nose or chin, sagging jowls, crow’s feet, or a loss of facial volume, and all of these conditions can effectively be treated by liquid facelifts. In the past, injections of collagens were primarily used as facial fillers, but the discovery of better products has increased the effectiveness of injectables, as well as the duration of their benefits. However, even the best liquid face lifts must be repeated every few months or years, depending on the area of the face and the product used, in order to retain the original great results. 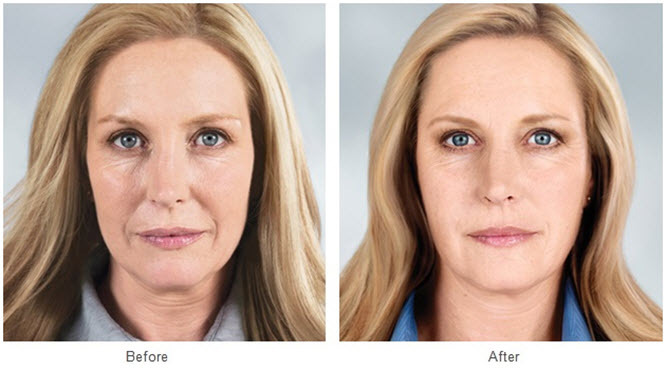 Another advantage of the liquid face lift process is that it can easily be administered in an outpatient setting, often within 15-30 minutes. Recovery time is also less than a surgical facelift procedure, because it is much less invasive than surgery. Many celebrities have already adopted this approach to facial care for just this reason, and despite the fact that the process requires periodic reinforcement, each treatment is still fairly quick and simple. An organization called the Liquid Face Lift Association, which is headquartered in Oklahoma City, OK has been formed to assist and educate interested individuals about the benefits of the process. The organization also helps to find highly qualified medical personnel who are experienced in the process, in specific geographic areas. Dr. Boris Ackerman is universally considered to be the finest plastic surgeon in Orange County, CA, with years of experience in body contouring, facial rejuvenation, traditional and liquid face lifts, breast augmentation and reductions, tummy tucks, and other procedures. He trained at the Massachusetts Institute of Technology, the Dartmouth Medical School, Ohio State University, and Cedars-Sinai Hospital. Dr. Ackerman is certified by the American Board of Plastic Surgery, and is a member in good standing of numerous professional associations.